I didn’t dress appropriately forgetting it is just the start of Spring and felt chilled in the mornings and evenings when the termperature dropped to 15C. Note to self, always take a pashmina with me when I travel! I was thrilled to discover silver card holders are now allowed back in the business class lounge but only in Dubai, I have missed my champagne and orange juice pre-flight treat. The flight left on time and I was met by the hotel representative who assisted me to get a visa on arrival which costs $20. There are ATM machines available if you need cash. Some of my Egyptian colleagues warned me to be careful this time, that law and order are not as well kept as before and that I should always travel in the company car and not stay at a hotel in the downtown area. So I took their advice and stayed at the Mina House hotel, one of the oldest hotels in Cairo located literally a 5 minute walk to the pyramids of GIza. It was first built as a hunting lodge for King Ismael who ruled Egypt in the late 1800s. Set on 4 acres of gardens, it was sold when he died in 1896 and turned into a hotel named “Mina House’ after the first of the 76 Kings of the Tablet of Abydos. In the 1970s Oberoi hotel took over the management but that contract ended on 31 December and no one seems to know what the plan is. It was here in 1979 that the Israel-Egyptian peace agreement was signed. If you like gold and ornate surroundings, this is a dream location. It is not what I would call a ‘business hotel’; no working desk in the room ( I sat on a soft lounge chair perched over the coffee which did nothing for my back); check-in is slow and you have to pay extra for internet. 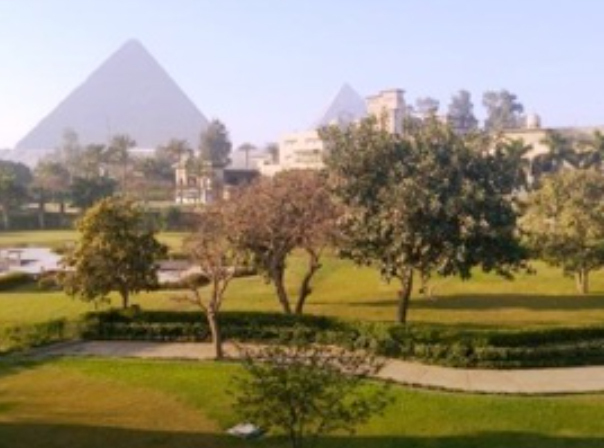 However, I had a beautiful garden view room with a balcony looking out to the pyramids and the sound of birds woke me every morning. Room service was terrible but each evening there was an enormous orange and two macaroons waiting for me. The strange check-in when they takie your credit card and passport away to a back room while you wait in the bar is concerning. The gym is large and well equipped with new cardio machines with screens though no head sets provided. I had the place to myself every morning. As I exited the hotel and headed for the office on the first morning with our company driver, it seemed nothing had changed since I came in June. The streets are as dirty and congested as before. Getting anywhere seemed to take at least an hour no matter what the distance. People in general say things are better, they can express themselves, protest, political sattire is very popular but there is an apathy that hangs over the city, like they have lost hope that things will ever get better. I passed a young boy one evening, standing in the middle of a busy road trying to sell cups of tea to drivers passing by while his adult partner managed the tea station set up on the small space that separated the two lanes of traffic. He couldn’t have been more than 9 years old. My heart sank as the sad reality hit me that childhood is something only ‘rich kids’ like my sons have the privilege of enjoying. Thank you to Mark who sent me an email before I left with a list of yoga studios he found on the internet. There is a studio called On The Mat, in Zamalek near the Nile and a Mysore Ashtanga centre. I selected The Breathing Room which is located in Maadi, Building #10/5, Rd 216 in a ground floor apartment. The first class is free to all. Fees thereafter are 60 LE or AED 35 per class or 500 LE for a pack of 11 – AED 25! Students pay even less! Noah is an American professor at the American University of Cairo and runs the place with his wife who is a yoga teacher. It is truly “Karma yoga” run to support those in need and there are many in this city of 9 million people. Karma is derived from the Sanskrit kri, meaning ‘to do’. “Karma” simply means action. 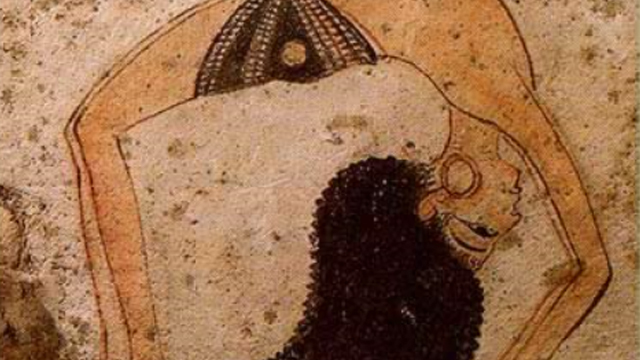 “Yoga” translates to union. 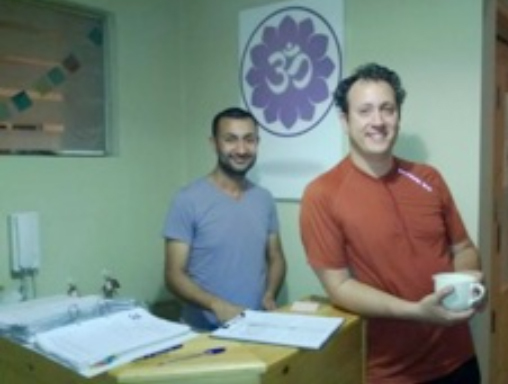 Thus “Karma Yoga” literally translates to “the path of union through action.” As the studio apartment was donated by the Egyptian owner, after the teachers are paid and running costs removed, all proceeds are donated to a centre which cares for street children and unwed mothers. The teachers regularly provide classes to them along with food and other supplies. Every month there is a karma class for a specific charity where all proceeds are donated and the teacher donates his/her time. The most popular style of yoga is Moksha yoga, a spin off of Bikram yoga. Noah, the manager on the right. I attended an Ashtanga class with Sue McDonagh at 6.30pm. I managed to convince my colleague Inas to join me for her first ever class and she really enjoyed it. Sue is American and a Yoga Alliance certified instructor, having completed her Radiantly Alive Yoga Teacher Training in Bali a few years ago. She is lovely, fun, serious, engaging. We were 10 people, two men, Noah the owner and the male receptionist. What I loved about this class and this centre, is the caring and compassionate energy. At the end of class Sue asked us to say hello and hug someone we didn’t know. Most of the students were from some other country but the few Egyptians that were there said how much yoga is growing. With the stress people are under and the traffic I can imagine how much it is needed. Inas, Sue, student and me after a very sweaty Ashtanga class. This weekend is the Full Moon Friday from 3.30 to 7.30pm. We have two male teachers, Barry Ennis teaching dynamic yoga and Shibashy Chakraborty from Talise Spa followed by a meditation session with Mona Karim. Thrilled to see we have 500 people registered so far. Book here to attend. This month, the focus in my classes at Zen Yoga is on hamstrings. Click here to read an article from Yoga journal about the importance of our hamstrings and listening to them, so we don’t over extend ourselves, something I need to constantly remind myself of. I leave you with a quote from Buddha which I found on the Breathing Room’s website. What small virtue can you do today to fill your life’s container? Do not think a small virtue will not return in your future lives. The little virtues that steadfastly accumulate will completely overwhelm you.